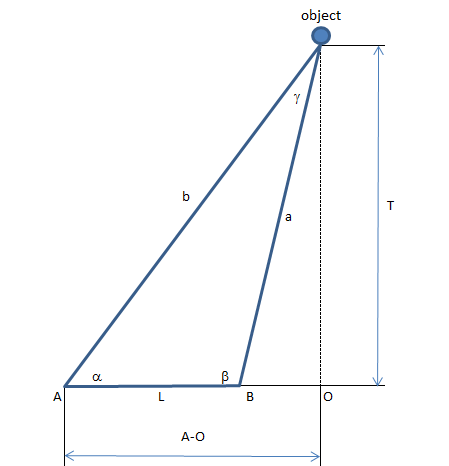 If it is required to measure the height of an object from a certain distance without the need to go to that object, and the distance from the observer to the object is also not known. With only a protractor and distance measuring tool, these measurements can be calculated. Distance from observer to objects can also be calculated, without the need to go to the object. To get accurate results, the distance A to B or L should be as long as possible, and the line L is an imaginary straight line through A and point O or base of object. The surveyors in the field of geodesy are using a Theodolite or Total Station, which is an instrument capable of measuring distances up to 1500 meters with an accuracy of 1.5 mm by a microwave or infrared device, and it is able to measure angles with an accuracy of nearly 0.5 seconds, so it obtains very accurate measurement results. The attached Excel document has a formula to calculate the height,and distance to an object. Distance units and are used can be anything, eg: feet, miles, feet, mile, etc..
For the measurement of angles, always use the unit degrees.